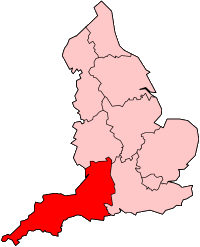 The Tamar Valley Line is a railway line from Plymouth, Devon, to Gunnislake, Cornwall, in England, UK, also known as the Gunnislake Branch Line. The line follows the River Tamar for much of its route. Like all railway lines in Devon and Cornwall, it is unelectrified and all trains are diesel-powered. The entire line is single-track past St. Budeaux Junction. The line from St Budeaux to Bere Alston was opened for passenger traffic on 2 June 1890 by the Plymouth, Devonport and South Western Junction Railway (PDSWJ) as part of their line from Lydford to Devonport, which in effect was an extension of the London and South Western Railway's main line from London Waterloo station to Lydford, enabling the LSWR to reach Plymouth independently of the Great Western Railway. The branch to Gunnislake was opened by the PDSWJ on 2 March 1908. The line was listed for closure in the Reshaping of British Railways Report but was kept open (apart from the section between Gunnislake and Callington - closed in November 1966) because the roads in the areas served were poor. The line used former LSWR O2 Class tank engines as the main form of motive power for many years but in the 1950s newer LMS Ivatt Class 2 2-6-2T engines took over. By 1964 steam had been ousted from the line and DMUs had taken over, working as two-car sets. Today services are operated by Great Western Railway using Class 150 or Class 153 diesel multiple units. The section between Calstock and Bere Ferrers is on the Bere peninsula, between the river Tamar (crossed by the Calstock Viaduct), and the river Tavy (crossed by the Tavy Bridge). The most southerly road bridge (the A390) on the peninsula is at Gunnislake, crossing the river Tamar. This means the railway is the quickest way of getting into the city of Plymouth to the south. There is a small railway museum adjacent to Bere Ferrers railway station which includes a number of converted rail coaches available for holiday let. The station sign on the signal box uses the older spelling of 'Beer Ferrers'. Passenger have the unusual experience of seeing the driver change ends of the train at the old junction station of Bere Alston. 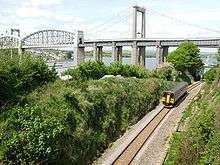 The overall number of passengers travelling on the Tamar Valley line declined in recent years, although numbers travelling to or from the two Cornish stations increased. More recently, passenger numbers have risen overall (from 157,743 in 2002–03 to 195,344 in 2011–12) but the traffic levels from Calstock (in particular) and Gunnislake have stabilised. The Tamar Valley Line is one of the railway lines supported by the Devon and Cornwall Rail Partnership, an organisation formed in 1991 to promote railway services in the area. The line is promoted by many means such as regular timetable and scenic line guides, as well as leaflets highlighting leisure opportunities such as walking or visiting country pubs. The Tamar Valley rail ale trail was launched in 2004 to encourage rail travellers to visit pubs near the line. Five are in Plymouth city centre and a further three in the suburbs of Devonport and St Budeaux. There are single pubs to visit at Bere Ferrers and Bere Alston, two in Calstock and six in Gunnislake. 6, 10 or 18 stamps collected in the Rail Ale Trail leaflet entitle the participant to claim special Tamar Valley Line Rail Trail souvenir merchandise. Wessex Trains covered Class 150 2-car DMU number 150240 in coloured pictures promoting the line and named The Tamar Kingfisher. It is now in service with Arriva Trains Wales and works throughout its network. The line was designated as a community rail line in September 2005, being one of seven pilots for the Department for Transport's Community Rail Development Strategy. This aims to establish the true costs and revenues for the line with an aim of improving them. It is also looking at simplifiying the reversal of trains, considering the costs and benefits should the line be "microfranchised" separately from the Great Western Franchise, and the potential for extending the line from Bere Alston to Tavistock. On 18 March 2008 Devon County Council backed a proposal by developers Kilbride Community Rail to construct 750 houses in Tavistock that includes reopening the 5.5 miles (9 km) line from Bere Alston to a new Tavistock railway station at a cost of £18.5million. ↑ Cheesman, AJ (1967). The Plymouth, Devonport and South Wesetern Junction Railway. Blandford Forum: Oakwood Press. ↑ Crombleholme, Roger; Gibson, Bryan; Stickey, Douglas; Whetmath, CFD (1967). Callington Railways. Bracknell: Forge Books. ↑ "Station Usage". Rail Statistics. Office of Rail Regulation. Retrieved 8 June 2009. ↑ Harris, Nigel (2008). "Taking trains back to Tavistock". Rail. Bauer (590): 40–45. Wikimedia Commons has media related to Tamar Valley Line.